This corporation is not in good standing as it has not satisfied all state tax requirements. If you need any additional information or assistance, please contact the Texas State Comptroller's field office in your area or call 1-800-252-1381, toll free, nationwide. The Austin number is 512-463-4600. If you are calling from a Telecommunications Device for the Deaf (TDD), the toll-free number is 1-800-248-4099, or in Austin, 512/463-4621. This page contains a consumer story about Direct Talent Source Model Management and expert advice from industry leaders. On [a] Saturday, I took my daughter to an open call for Direct Talent Source (DTS). They asked us to come back for a brief meeting that evening. During the meeting, they explained that they are an agency. They said the only way they make money is by taking a 20% commission on the jobs they book. At the meeting, they handed out a sample "Personal Management Agreement" for them to be our non-exclusive agent. It seemed very straightforward and on the level. The speaker stressed the importance of comp cards. He said the only way they can get us work is if we have the best possible comp cards. We were told that we could find our own photographer, but that we must use a "high fashion" photographer. He then started listing a lot of places we could not use: local portrait photographers, photo studios, etc. After all this he said they will have a photographer coming in town that we can use. He said there were 75 people in the room right now, only 25 will be picked to be represented, then he also said they will only have time slots for 20 of us to use his photographer. The cost of the photographer was $179 deposit; $235 at the workshop to be held 3 to 4 weeks later; and $235 at time of photo session for a total of $649. He then had us go home and call back the next day to find out if we made it. On Sunday, I called back and was told my daughter had been selected. We were told to come sign the Personal Management Agreement. When we got there, we signed the Agreement and were given another "Photography Shoot Agreement" which we had not seen before. This agreement says there will be another charge for printing the comp cards. This cost was $250 + $15 set-up fee for 100 cards. It also says a $50.00 rescheduling fee will be added if model does not show for photo shoot. It also states there will be no refunds on deposits and/or payments of a canceled photoshoot agreement. Long story short... we paid the deposit so that we could be assured of using their photographer. 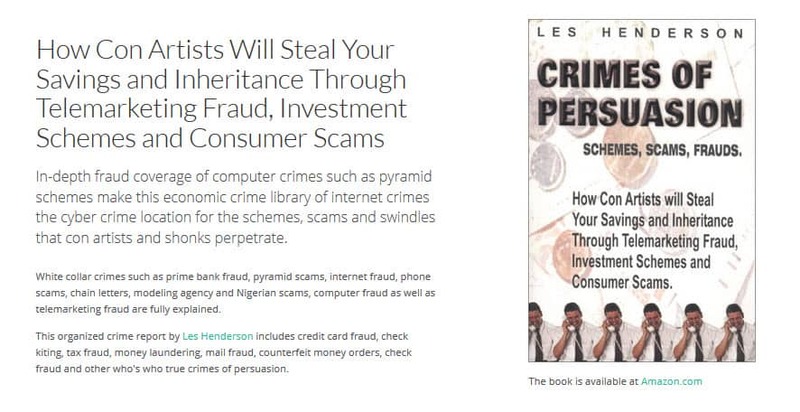 This company makes a very good front of being legitimate. They give you handouts on what to take with you to an assignment, even copies of the payment vouchers you use. There are a lot of details on how to get paid, how to dress, how to act on an assignment, etc. Yet they have a list of companies they say they represent, but the pictures they have are just cut-outs of the products from magazines and they don't even feature any models! These are things that are really easy to overlook when you are getting caught up in the moment and told that if you don't book their photographer now, there will not be any availibility later. Is there any possible way to get my $179 deposit back? If not, is there anything I should do to cancel the agreement, other than not paying them any more money? Mike Curley (?sp), a leader of DTS, is a former employee of On Track Modeling (OTM), an event staffing company widely criticised for violating industry standards by collecting fees, charging models, and making a profit from professional photography and comp cards. The business model, flyers, contracts, sales pitch, prices, and practices of DTS are identical to those of OTM. Curley was criticised by a consumer who had a bad experience with On Track Modeling related to, guess what? Expensive photos! Curlee is now doing with DTS exactly what he learned at OTM. The total fraud is saying a fashion photographer is needed for event staffing jobs. This is so far from the truth. The entire fraud is based on the one lie. If DTS has landed models they represent fashion modeling jobs, they will have tear sheets to prove it. If they have not landed the models fashion modeling jobs, it is fraudulent to imply the models will get fashion modeling jobs (and therefore they need a fashion photographer). The whole purpose of saying you need a fashion photographer is to trick you into using their photographer so you will pay them so they will take your money and who cares if you get jobs or not? If DTS was honest and if it only gets people non-fashion photography jobs, they would tell you the truth which is you don't need a fashion photographer, you can use portrait photographers, photo studios, etc., and even good amateur snapshots. By saying you need a fashion photographer and knowing there are likely none in your area of Anytown, USA, the vast majority of people present at the DTS photo sales meetings are going to choose their photographer (who, incidentally, may not even be a fashion photographer!). The prices recommended by Direct Talent Source Model Management and the amount of money they collect is far in excess of fair pricing. You can get photography for half the amount they are taking (or less); and comp card printing for less than half the amount they want. Upon information and belief, Direct Talent Source Model Management is an event staffing agency, not a fashion modeling agency, nor a print modeling agency. EventPro Strategies, a national event staffing agency, which has over 5,000 signed up to do promotional work, does not require a fashion photographer, comp cards, nor professional photography, only non-professional snapshots. Texas talent agency law prohibits fee splitting. If this company does not transfer the payment by consumers to the photographer and printer IN FULL, it is fee splitting. To determine if they are fee splitting, contact the photographer and the printer directly, and ask them for a copy of the receipt they received from DTS. If you pay DTS $649 for photography, and they do not fee split, the photographer must be able to send you a copy of a receipt from DTS for the amount of $649. If you pay DTS $350 for prints, and they do not fee split, the printer must be able to send you a copy of a receipt from DTS for the amount of $350. Please note this company paid a $10,000 bond to get a Texas talent agency license. If you paid DTS, and you want your money back, you can make a claim on the bond. You simply state your case to the Texas Department of Licensing and Regulation. The money is not extracted from or by DTS. You don't have to make your case to DTS, only to the TDLR. > they were signing people up at. > some people it really was not all that strange, because my daughter is tall, slim, and beautiful. > Thank you for your time!!!!!! Tell them DTS collected your money for photography and comp cards, and split the fee with the photographer and printer, which is illegal under Texas state laws, and they never got your daughter work, so you want all your money back. Ask them to confirm DTS paid the $10,000 bond, and say you want your $1,000 from that bond. The purpose of the bond, and the reason why agencies have to pay the bond, is insurance for consumers in the event a talent agency commits fraud or engages in any illegal activity. 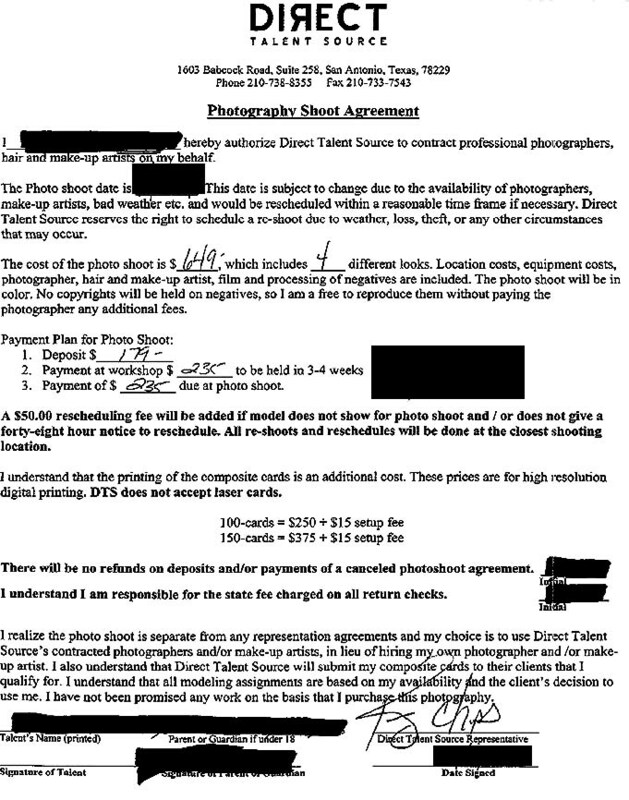 It is illegal for a Texas talent agency to split fees with a photographer or printer. Please write back with a full update regarding your conversation with the TDLR so useful information can be given to others in the same predicament. We went through some horrible times with Direct Talent Source in San Antonio. Our daughter had been a model for four years and we left one reputable agency to go to DTS. Big mistake! BBB showed no records that led us to believe they were anything but legit. We were told our daughter was chosen after a lecture and interview. We had just had a few pics taken for her portfolio before going there and it happened to be the same photog they had just recruited. His prices went from cheap to high end. Anyway, they went ahead and let us order the comp cards for $250 plus $15 set up fee. That was in 2003. We never heard back, got any calls for work, and noone would return my calls. The acting agent was Bryan Shockey, whose boss was Shontelle Shockey, and hers, Mike Curlee. Neither would return my calls. No one would ever talk. I emailed Mike Curlee under a different email addy and he responded and said they were sitting at the printers in Florida. Finally, in October 2003, we contacted the local BBB. They got involved and Jeff said he would refund our money ASAP. He never did so we filed a small claims suit. He settled out of court with a cashiers check a day before he was served. After we cashed it he called and asked us to try again and he would be opening another agency here in San Antonio with another agent running it. Fortunately our daughter is back with a reputable agency, even though we were leary at first. How does one stop this guy, as he is still there just in a different suite? What a shame so many models have to go through this.